Delaware Truck drivers work long hours, and this grueling schedule can put them at risk of falling asleep at the wheel. Thus, truck drivers are subject to specific laws that regulate their workdays. Federal mandates dictate when and for how long operators can drive before taking a rest. 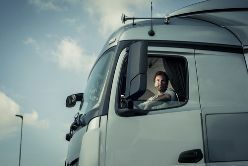 These restrictions are intended to keep truck drivers fresh and alert while on the road and help avoid dangerous collisions caused by drowsy drivers. Many drivers have experienced the effects of fatigue while covering long distances in a car. Truckers experience this to an even greater degree due to the very long hours demanded of them, and the dangers are heightened when a large, heavy commercial vehicle is on the road. Truck crashes are among the deadliest traffic events. According to the Federal Motor Carrier Safety Administration (FMCSA), over 3,800 fatal crashes involved a large truck or bus in 2013. Though there were many causes of these accidents, drowsy driving was a serious concern. The FMCSA reports that at least 13 percent of truck drivers were considered fatigued at the time of the crash. Drivers have a 14 consecutive hour period in which they may drive a total of 11 hours. After eight consecutive hours, the driver must take a rest of at least 30 minutes. Drivers may not travel more than 60/70 hours in a 7/8 consecutive day period. To re-start a new week, a driver must have at least 34 consecutive hours off duty. Sadly, death is not an uncommon result of accidents involving these large vehicles. Whether you are a survivor of a truck accident or mourning the loss of a loved one, a qualified attorney may be able to help. Contact the experienced Delaware Truck Accident Lawyers at Morris James Personal Injury Group, for a free, no-obligation consultation today.